This is an aspect we want to point out from the multiple actions of Vinpocetine. Neurotransmitters are responsible for the transmission between neurons, they are necessary for all cognitive functions. The fact that Vinpocetine increases the levels of various neurotransmitters gives us a basis of its ways of action. 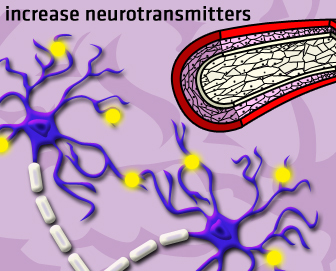 Vinpocetine seems to act on neuronal transmission. 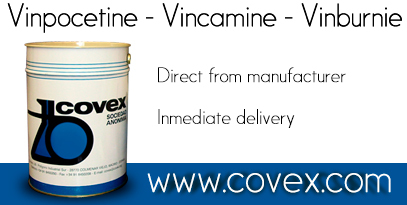 Vinpocetine increases levels of Noradrenaline (a neurotransmitter or cathecolaminergic nature, found principally in neurons of the locus coeruleus). Vinpocetine increases levels of Dopamine (it is found in various neurochemical cerebral via such as the nigrostriatal, mesolimbic and mesocortical. Disorders at this level have been related to schizophrenia. Vinpocetine increases levels of Serotonine (found in the nucleus of the raphe) It has been associated to appetite and emotive disorders. Vinpocetine increases levels of Acetylcholine (found in many areas of the Central Nervous System, principally in the basal ganglions and cerebral cortex) It is associated to memory and memory loss. As stated above, memory is a extremely complex phenomenon and now we have to say that neuronal transmission is even more complex. There are more than 100 identified neurotransmitters, and until now we still do not know which are the functions of each nor the reason for such a great number. Levels of certain neurotransmitters are associated to psychiatric disorders, such is the case of serotonine and clinic depression. But these associations are not exclusive. The only clear fact is that the diversity of neurotransmitters must have a function. This is the reason why we cannot exactly explain how Vinpocetine acts but we can state that Vinpocetine has effects at the level of neurotransmission, as a matter of fact the empirical formula of Vinpocetine is very similar to that of neurotransmitters. We can state that Vinpocetine has effect at the level of neuronal transmitters and that it also has a generally beneficial action on cerebral metabolism.